The Saudi-led coalition fighting Houthi rebels in Yemen acknowledges "mistakes" were made in last month's deadly airstrike on a school bus in northern Yemen, the Saudi Press Agency said Saturday. The attack killed 51 people, including 40 children, according to the Houthi-held Health Ministry. The coalition cited "mistakes in compliance to the rules of engagement." The children had been on a field trip to a graveyard for rebels, one of the few green spaces left in Yemen's Saada governorate. In a statement, the command issued "regret over the mistakes, extends its sympathies and solidarity to the families of the victims." It issued its conclusions after reviewing the findings of an assessment team. "The Joint Forces Command will, as soon as the official findings are received, undertake legal proceedings to hold the ones who committed mistakes accountable according to the rules and regulations related to such cases," the coalition said. It added that it will "continue to revise and enhance its rules of engagement according to operational lessons learned, in a manner that guarantees non-recurrence of such incidents." CNN established that the bomb that hit the school bus on August 9 and killed dozens of children was US-made and had been sold to Saudi Arabia as part of a State Department-sanctioned arms deal. The explosive was found by CNN to be an American-made, 500-pound (227-kilogram), laser-guided MK 82 bomb, a weapon similar to one that killed 155 people in an October 2016 attack on a funeral hall in Yemen. Earlier that same year, a strike on a Yemeni market -- this time reportedly by a US-supplied precision-guided MK 84 bomb -- killed 97 people. CNN learned this week that the Pentagon warned Saudi Arabia it is prepared to reduce military and intelligence support if the Saudis do not demonstrate efforts to limit civilian deaths in airstrikes. The United States has defended its role. It says it does not make targeting decisions for the coalition. The crisis quickly escalated into a multisided war, with neighboring Saudi Arabia leading a coalition of Gulf states against the Houthis. The coalition is advised and supported by the United States and the UK, among other nations. On Tuesday, a UN panel of experts said parties fighting in the civil war have conducted attacks that were "disproportionate" and could be considered war crimes. The UN report covered the period from September 2014 to June 2018. All sides are "responsible for a violation of human rights" and crimes "continue to be perpetrated," the report said. 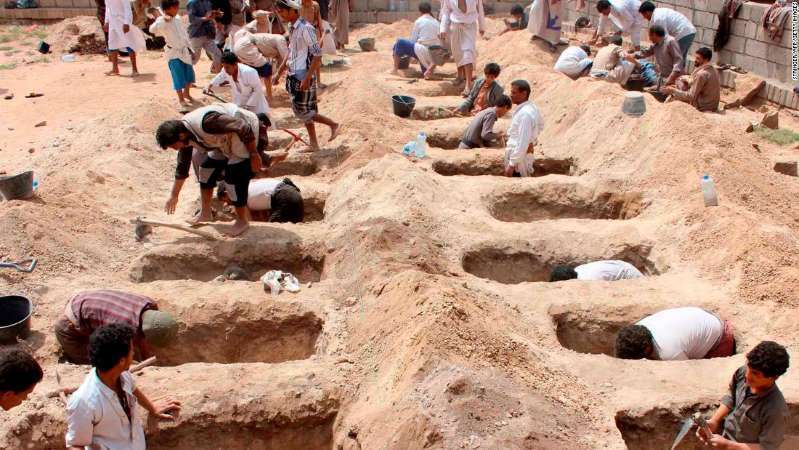 The report points to thousands of civilian casualties caused by Saudi-led coalition airstrikes, widespread arbitrary detention, torture, sexual violence and the conscription of children as young as 8 into Yemen's armed forces, all of which are crimes under international law. Since March 2015, 6,660 civilians have been killed in the conflict and more than 10,500 injured, according to the UN Human Rights Office. Experts have said the real numbers are likely to be much higher, pointing to coalition airstrikes that have hit residential areas, markets, weddings and medical facilities. The fighting has continued since the August 9 airstrike on the school bus, which sparked international outrage. In late August coalition airstrikes killed 30 people, including 22 children in a rebel-held area in northwestern Yemen, according to the Houthi-controlled Health Ministry.